At Kaplan K12 Learning Services, Sari Factor '85 follows her belief that businesses can "do good and do well." 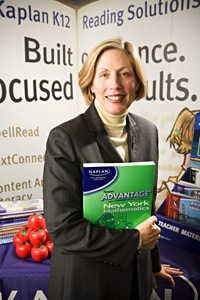 Factor, named president of the K12 division of global educational services provider Kaplan Inc. earlier this year, has combined her Kellogg School MBA with a bachelor's degree in education to create a string of successes in educational publishing for more than 25 years. Now applying those skills at Kaplan, she helps the company partner with schools to provide instructional programs for both students and teachers. "We work with districts to create solutions based on their needs," Factor says. If a district needs curricula written, as the Chicago Public Schools did for its High School Transformation initiative, Kaplan helps develop the product, which it did for language arts in 2006. While she finds the business side of the role exciting, Factor says she finds pleasure in leading an industry that is "helping people and making a difference in the world." "We're working with the largest school districts with the most challenged students on a day-to-day basis, providing materials and services," she says. "For me, that is a mission worth pursuing. I can impact many more students and teachers as a result of the kind of work that I've been doing." Factor's career in publishing began soon after her first teaching experience post-college. Instructing a six-week summer course to a group of seventh graders who had failed math, she says she lacked the materials or assessment data from the previous year to help students advance. She realized there had to be a better way. "I decided that being in the classroom without the proper tools wasn't the right thing for me, but I hoped that I could affect kids by creating those tools and help teachers by providing them with the resources they need," Factor says. "What turned out to be a very short teaching career launched a great career in educational publishing." Early in this career, she found herself managing many people, but she lacked formal training. That's when she turned to the Kellogg School's Part-Time MBA Program to earn a degree while continuing to work. "[Being a part-time student] was ideal because I was able to apply the things I was learning through the program to my work every day," she says. She pursued concentrations in marketing and operations management. She believes the combination has served her well. "I can swear by a Kellogg education," Factor says. "Here's this teacher who didn't have any business background ... but through the coursework and team meetings, I learned a lot." She credits the school's marketing expertise and its team-oriented approach for her success, which is evidenced in the marketing roles she has held at Scott Foresman and McDougal Littell, and as a general manager at Everyday Learning Company and president of Macmillan/McGraw-Hill. Factor says that she intends to help Kaplan continue to focus on the populations that need its services most, which includes at-risk students and new teachers as they help students improve academic achievement. "Today, you have a diverse student population in the schools, not just ethnic diversity, but language diversity, socioeconomic diversity and diversity of learning styles," she says, adding that there is an increasing recognition that an educated workforce is good for the economy. She has seen an emphasis by state and local governments to help all students achieve success. "School districts are struggling to come up with the best practices and research-based techniques for helping those kids," Factor states. "Our goal is to help propel student achievement by showing what we've been able to do in other districts."